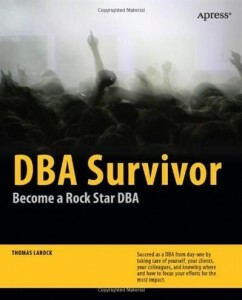 I recently read through Thomas LaRock’s book “DBA Survivor: Become a Rock Star DBA”. It was a nice read that walked the reader through the basics of being a DBA. I have mixed opinions about this book though. 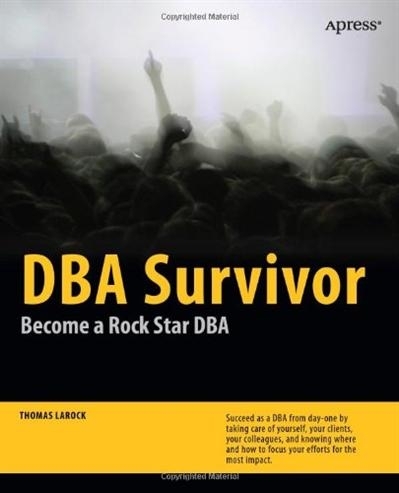 Some of the first chapters are about starting a new DBA job and what you should be doing. This was rather convenient for me because at the time I was starting a new job. LaRock gives a list of things you should first do and check. This is great in theory but my first day I was rushed into a meeting and tossed onto a project. Before I could get to number one on his list, I was already knee deep in fixing jobs, answering SQL questions, and sitting in meetings. The beginning of the book talks about getting a DBA job, who to talk to, what to read, etc. Lots of good advice for people starting out in the industry. It then moves on to what to do when you first get your first DBA job. Again, I think this is great in theory but I don’t know anyone who got their first DBA job through an interview. Everyone usually starts somewhere else – QA (my personal experience), developer, sysadmin, or something other related field. I did enjoy this part of the book though. It was able to fill in some holes for me. The next part talks about office basics and what to do and not to do. If anyone has worked in an office, they’ve probably encountered most of what he is talking about here. Eat lunch with people, don’t talk about people, be nice, and most common sense stuff. The next couple chapters is where it starts to get good. We’re talking about the raids, the HA’s, the SLA, and all the interesting stuff about database life. There are some great examples of what you should use and where. This is the perfect juicy stuff that would satisfy a newb but could also reteach an old timer something he/she hasn’t been exposed to in awhile. Chapter 6 is the best section by far. This is where the author gets into troubleshooting. I reread this section more than once. The book then goes in and out of sounding like a support book for people having trouble in an office – “Be nice”, “Work/Life Balance”, “Job Security”, and so on. I think these are important in any job but I didn’t particularly care for these sections. Especially the sections on watching what you eat. Not all DBAs are big fat dudes. The last part of the book focuses on training. I thought this part was ok because I never really tried to persuade my boss to send me for training. I’m not against training but I probably wouldn’t spend a lot of time trying to get the money for it either (although I have to admit, PASS Summit is pretty cool). Overall I thought this book was a good quick read and perfect for people new to the IT field and new to the database industry. If I was a professor in college, I would definitely recommend this book to new graduates or even people thinking about becoming a DBA. I give it 2.5 sandwiches out of 5.